This is the second post in a series detailing the many British Catholic Author Collections of the Burns Library. You can read previous posts here. In the John J. Burns Library’s British Catholic Authors Collection there are several distinct collections built around specific authors. Of these, the first to be acquired and developed was the collection of books and manuscripts by and about Francis Thompson. The principal collector of Thompsoniana was Terence L. Connolly, SJ. Father Connolly had written his doctoral dissertation at Fordham University on Francis Thompson and was teaching in the English Department at Boston College when he heard about a collection of Thompson’s manuscripts owned by Seymour Adelman. Adelman, a rare books and manuscripts dealer, began his collection of Thompsoniana after reading Thompson’s poem, “The Hound of Heaven,” in his college years. He soon acquired everything he could buy about Thompson and eventually amassed an excellent and wide-ranging collection. In 1934 Fr. Connolly asked Adelman to lend his Thompsoniana to Boston College for an exhibit, which attracted many visitors and was widely praised. Soon afterwards Adelman offered to sell his collection to Boston College for a price far below its appraised value, but still a challenging sum for a small college. By 1937 the funds had been raised and the manuscripts and books by and about Francis Thompson and many people associated with him were housed in a special room in the Bapst Library at Boston College. The Thompson Room in the Burns Library as it appeared in 1941. Wilfrid Meynell Collection, MS1986-042, Box 2, Folder 19. The Francis Thompson Room in that library still houses books, portraits, and other materials, while the original manuscripts are stored in more secure and climate-controlled areas in what are now the John J. Burns Library of Rare Books and Special Collections. 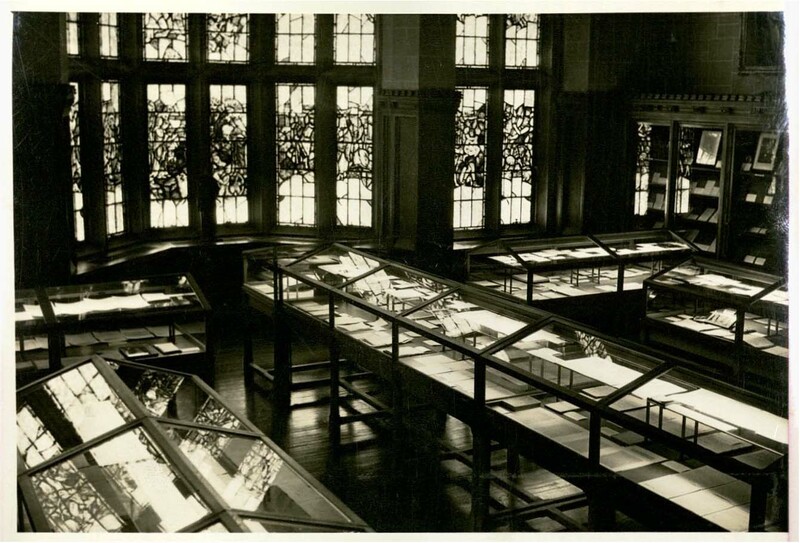 Materials received in 1937 through the generosity of Adelman and many other people are still known as the Seymour Adelman Collection of Thompsoniana. To celebrate the Thompson acquisition, Fr. Connolly published a catalog of the items received from Seymour Adelman and other materials connected with Thompson. 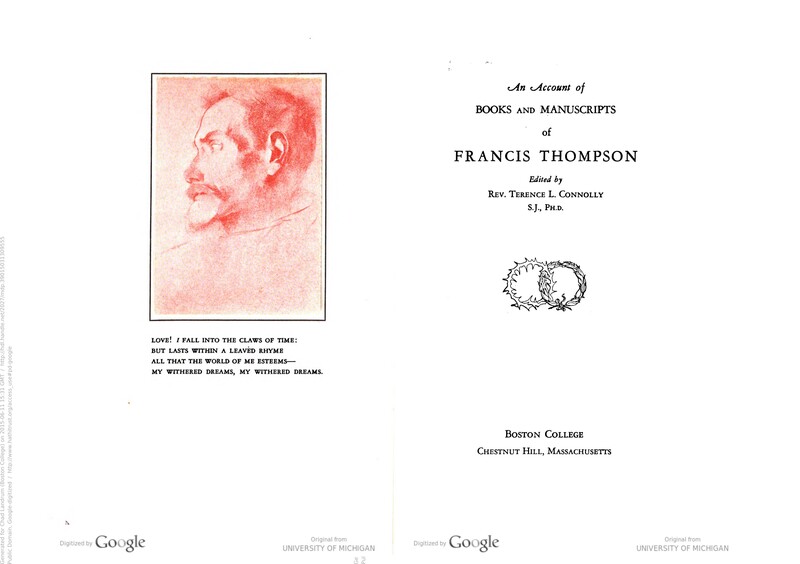 The catalog, An Account of Books and Manuscripts of Francis Thompson has been digitized and is now available full-text online to BC members (and other subscribers) through Hathitrust. Opening essays of the catalog tell the story of Adelman’s early and growing interest in (perhaps obsession with) Francis Thompson, and Fr. Connolly’s appreciation of the Adelman collection. Fr. Connolly attributes the acquisition of the contents of the catalog to “the generosity of our benefactors, to the devotion of Mr. Seymour Adelman, to the measureless kindness of Mr. Wilfrid Meynell and to the prayers of the poet’s sister, Sister Mary Austin.” Fr. Connolly was always careful to give credit to the many people who helped to build up the special collections at Boston College, and in this catalog he lists two pages of names, with two columns per page, and notes that subscriptions for the purchase are still being received. Many of these benefactors constituted an informal group of “Friends of the Library.” In the 1950’s the arrangement was made formal. In the catalog more than fifty items are from the Seymour Adelman Collection. Thirteen others are the gift of Mary Donnelly, who had been a generous benefactor and continued in that role for the next two decades. Adelman collected books and manuscripts by and about people who influenced Francis Thompson. These items include autograph letters of Percy Bysshe Shelley, Samuel Taylor Coleridge, Sir Walter Scott, Thomas de Quincey, and Dante Gabriel Rossetti. The principal subject of the catalog, Francis Joseph Thompson (1859-1907), was born on December 18, 1859, in Lancashire, England. Thompson’s parents were converts to Roman Catholicism, following the lead of John Henry Newman. From a young age Thompson was very religious and expressed his desire to become a priest. In 1870, Thompson enrolled at St Cuthbert’s College in Ushaw, near Durham, to study for the priesthood. While at St. Cuthbert’s Thompson began his life-long habit of keeping notebooks that contained lists of his daily activities, and descriptions of his literary efforts. Beginning with the Ushaw College manuscript, these notebooks came to total over one hundred. Thompson left Ushaw College in 1877 to follow in his father’s footsteps and begin medical studies at Owens College, University of Manchester. Thompson struggled in medical school. He was often distracted by his poetry writing and haunted by the dissecting rooms and gruesomeness of medical science. He also suffered a great emotional blow in 1880 when his mother died after a long illness. Her illness required opium as a painkiller and it is likely that it was at this time that Thompson himself became addicted to the drug during routine medical treatment from his own bout of fever. In 1885 Thompson moved to London. After many failed attempts to secure paid work, he began to live on the London streets. During this time, Thompson kept up his habit of writing in his notebooks. The notebooks that survive from this period offer vivid insights into Thompson’s fragile and often depressed state of mind. In 1887, after two years on the streets, Thompson sent the manuscripts of several poems to Wilfrid Meynell, editor of Merrie England, a Catholic literary journal. The manuscripts went unnoticed for many months. In April 1888 Meynell realized they were quite good and published one of the anonymous poems (“The Passion of Mary”) in hopes of finding the author. Thompson heard of the publication, claimed his poem and was soon living a normal life, through the kindness of Wilfrid Meynell and his wife, Alice. The publishers page from the April 1888 edition of Merrie England, 10-000006386 Francis Thompson Collection, John J. Burns Library, Boston College. 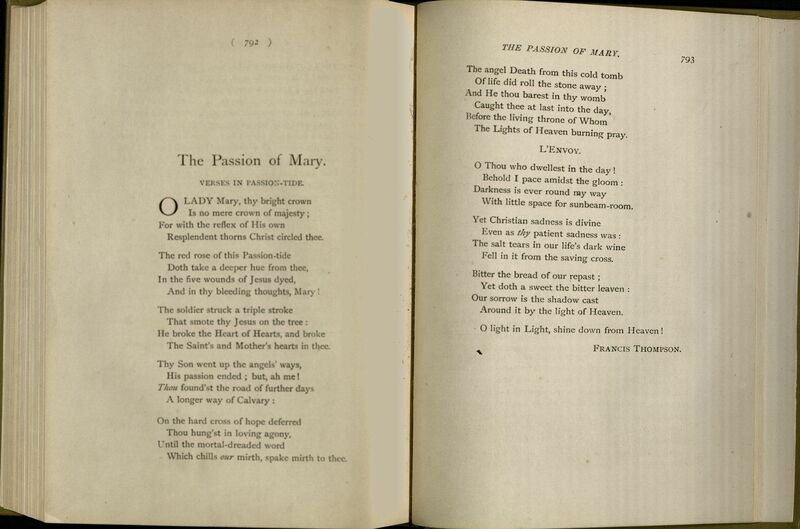 The Passion of Mary by Francis Thompson, the poem was originally published anonymously with the intent of finding the unknown author. 10-000006386, Francis Thompson Collection, John J. Burns Library, Boston College. Later in 1888, due in large part to the Meynells’ urging, Thompson began a stint at a rehabilitation center in order to overcome his opium addiction. While there, Thompson wrote two of his best known poems: “Ode to the Setting Sun” and “The Hound of Heaven.” Both poems explore the theme of Christian rebirth and a rediscovery of God’s goodness. The latter poem clearly draws on themes from Thompson’s Catholic faith and from his experiences on the streets of London. Throughout the 1890’s Thompson worked closely with the Meynells. He wrote poetry, book reviews and essays for Merrie England and other prominent London literary journals. He also spent a great deal of time at the Guildhall Library or the National Gallery exploring and researching ancient beliefs and their symbolism. He recorded much of his studies in his notebooks and these themes pervade the poems written during this time. In 1892 Thompson was again taking opium. The Meynells suggested that Thompson spend time at a Franciscan friary in north Wales in order to recover once again from his addiction. Thompson was to spend the next four years at the friary. He was inspired by the Welsh scenery and his time in Wales was immensely productive. Thompson’s first volume of poetry, “Poems”, was published in 1893 to mixed critical reaction. “Sister Songs” followed in 1895 and “New Poems” in 1897. Most critical reviews were negative, and Thompson was full of doubts concerning his future as a poet. Thompson died on November 13, 1907, just a month short of his forty-eighth birthday. Thompson’s only possession at the time of his death was a tin trunk of papers. These papers were manuscripts and notebooks accumulated over a lifetime, from which Wilfrid Meynell edited both poetry and prose for posthumous publication. During his lifetime, Thompson wrote several hundred poems (many were published anonymously, so attribution is sometimes difficult), as well as numerous reviews and critical essays. Many of the original notebooks are in the Burns Library, donated to Fr. Terence Connolly by Wilfrid Meynell. Brigid Boardman, an English scholar, wrote a biography of Francis Thompson and edited an expanded edition of his poems. Boardman relied on the Burns Library collections for her extensive research. Living in the north of England and then being adrift in London, Francis Thompson had had no contact with people in the Catholic Literary Revival. He did know about Merrie England, and only when his poems were published there and he had been taken up by Wilfrid and Alice Meynell, did he become part of a wide circle of Catholic intellectuals and authors. 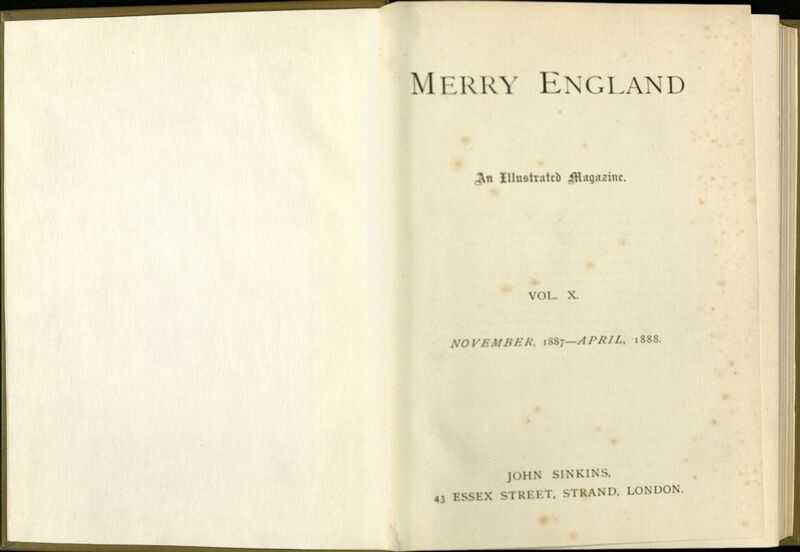 Significantly, the issue of Merrie England that included his poem “The Passion of Mary,” also had an article by John Henry Newman. It would seem that if any one person, or in this case two people, were at the center of this Catholic literary circle in the 1880’s, they were Wilfrid and Alice Meynell, the subjects of one of our next post in this series. This entry was posted in Archives & Manuscripts, British Catholic Authors, Featured Collections & Books, Staff Posts, Student Posts and tagged alice meynell, archives and manuscripts, BCA15/16, Burns blog, burns library blog, burns library boston college, burns library thompson collection, catholic liteary revival, francis thompson, hound of heaven, john j. burns library blog, meynells, wilfrid meynell. Bookmark the permalink.